Keishi-style coin pearl and gold Y necklace. 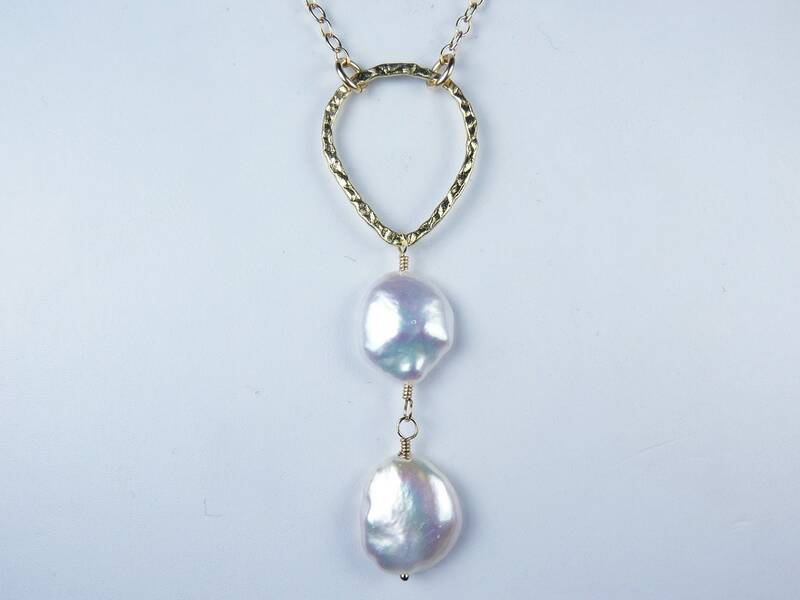 Two large, high-quality, keishi-style, coin pearls with extremely thick nacre, gorgeous luster, and shimmering colorful highlights are wrapped with 14K gold filled wire and are suspended from a large, hammered, gold vermeil (gold-plated sterling silver) inverted teardrop. Every pearl has a unique and irregular shape, and these unusual pearls really glow! The pearls are approximately 14-15mm (9/16") in diameter, but the size and shape of the pearls in each necklace may vary slightly. The vermeil inverted teardrop is 24mm x 20mm (15/16" x 3/4"). The teardrop and the wire wrapped pearls form the leg of the Y, and they dangle approximately 64mm (2 9/16") from 14K gold filled rings and chain. The necklace fastens securely with a 14K gold filled lobster claw clasp. The necklace in the photographs is 18" long. This stunning necklace would be perfect for a bridesmaid or a bride!